The Vizio M552i is priced to move off the shelves at $899.00. That's an excellent value for the amount of screen space and features included here. The 2014 rendition of the M series has focused on upgrading picture quality and smart TV features. It is important to note that Vizio has ditched 3D playback in all M series models this year. It keeps the price down, but may not be good for those who have been building a 3D content library. Full-array backlighting is the star addition that has a direct effect on the overall picture quality. This bumps the contrast to levels that compete with some of the big name TV manufacturers. Vizio's internet apps plus provides access to all the streaming services you'll need as well as second screen abilities for smartphone and tablet integration. The overall 2D picture quality of this TV will depend a lot on the picture mode you select. Active LED Local Dimming with 32 zones to enhance contrast control is one of the standout picture quality features of the M552i. Black levels are more saturated than we saw last year, and the TV certainly has plenty of brightness in whites. Active Pixel Tuning helps even further with a quality image. In terms of sharpness, we've seen better from the big names like Sony and Samsung. This is a result of the picture processing engines. It is certainly not among the worst. To further the screen refresh rate, Vizio includes a 720 Clear Action Rate feature. This will help with sports programming and fast action, but it should probably be left disabled most of the time. The M552i suffers the same fate as all the LED TVs before it have suffered: poor side angle viewing. Viewed from about 30 degrees off center, there is noticable contrast and color loss. As the viewer moves further off center it worsens. Since this is a 60 inch display, the setup of the room may help make sure that this isn't an issue. It's not the worst offender out there, but it is worth noting. LG has been using a lot of IPS panels this year that work to better the issue if you are concerned about this in your TV room. The M552i-B2 features active LED Local Dimming with 32 zones to enhance contrast control is one of the standout picture quality features of the M652i. More zones like this are definitely better, and we do see slight benefits when the dimming is activated. The Active LED Zones option in the Advanced Picture Settings controls this feature. This will have to be left to personal preference as we don't mind one way of the other. It is a nice inclusion to see on a value oriented LED TV. 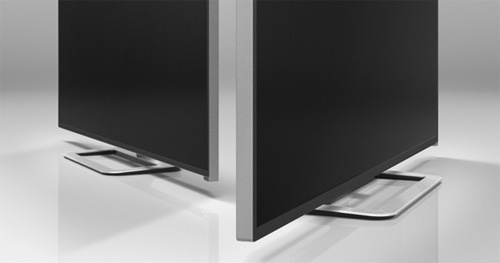 The OPC (Optimum Power Control) control is very hidden in the menu of the M-series Vizio TV, but it can and should be turned off due to the distracting influx and outflow of light/brightness produced by the backlight. Out of the box, it will be set to On position for any of the preset picture settings. When I recently retested the M-series from Vizio I found it added unnecessary picture noise when light flow moved up or down lagging the picture image. The OPC's purpose is to save energy by manipulating the backlight through the M-series 36 backlight zones, or probably more accurately to lower the Energy rating for Vizio's TVs. But at less than $1 a month total, and just a few cents per month for the OPC feature, you probably prefer a better picture. To turn it off: Go to Picture Settings, scroll down to More, Scroll down and click Advanced Picture at he bottom of the menu, Click on Backlight Control and turn Off. Vizio has added a Plus to the name of their smart TV features this year. 802.11n Wifi is built right into the TV for an excellent connection that will handle HD streaming without a problem. 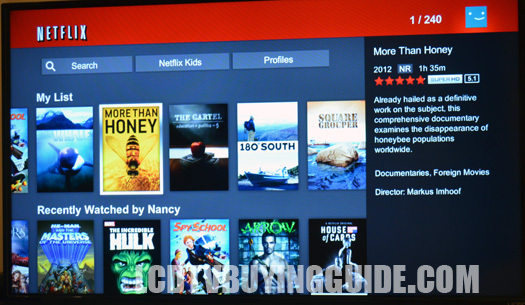 Some of the major streaming apps include Netflix, Hulu Plus, Amazon, Vudu, Pandora, and all the social media you need. The new backlit remote even has dedicated buttons for Netflix, Amazon, and M Go. The whole platform has recieved a redesign in order to achieve an inuitive user interface. We think it is an improvement upon previous iterations. Second Screen interactivity is also a feature for iOS and Android devices. The M552i features the same design as previous M series models with a few slight improvements. The 8mm thin bezels really push the frameless look and are 20% thinner than last year's bezels. The base and neck are made out of metal to give it a solid construction and feel. The profile is razor thin and competes with the best LED TVs on the market. We thought the desing was average last year and that still stands, but thinner bezels are always a welcome addition.